A few days ago, we talked about how a fascinating animation short objectively (yet poignantly) showcases the profound loss of life during World War II. Well, this time around, yet another craftily-made animation short takes up yet another military history subject matter – but at the other end of the time spectrum. We are talking about the famed Roman army and its incredible scope of organization. The graphical visualization does a praiseworthy job of explaining this ancient ambit in a rather simple manner – with short descriptions of each army unit, their collective formations and their inter-relations on both the battlefield and the political field. However, we would suspect that this so-called ‘Roman army’ explained in the video only represents the post-Marian legions (a Roman military reform that only took place after 107 BC). Hence, we are given a dose of a wealth of terminologies, including centurion, signifer, tessararius, cohort and so on. 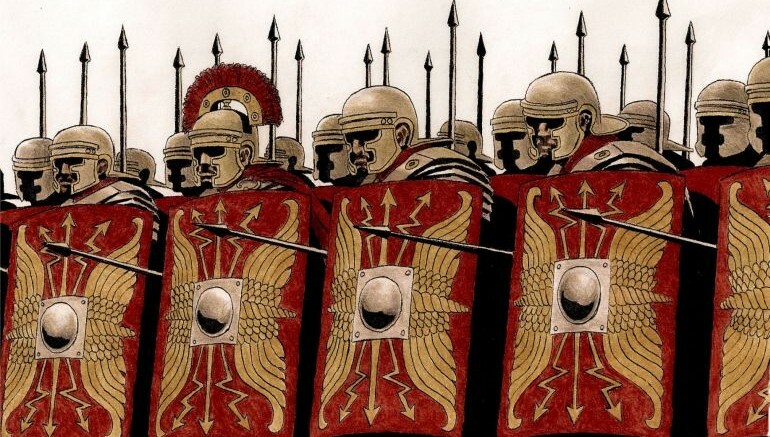 These myriad units and their intricate roles aptly demonstrate how a Roman legion was not about individual capacity, courage or ferocity (like their nemesis, the Gauls). Rather it was more about disciplined teamwork, formations, and their remarkable executions on the battlefield that resulted in a combined strength of arms. And since we brought up the ‘disciplined’ side of affairs, you would be also interested in knowing about decimation – a brutal (and rare) Roman military practice reserved for indiscipline in ranks.